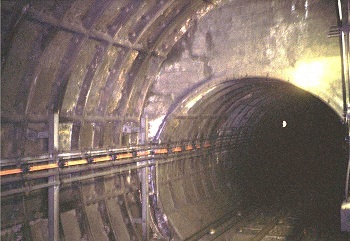 During the building of the Heathrow loop on the Piccadilly Line to service Terminal 4, the constructors Thyssen-Taywood sank 2 shafts in order to facilitate its construction. One shaft was sunk near Sanctuary Road and another near Wessex Road, about half way through the loop. The Wessex Road location was close to where a future fifth terminal for Heathrow was envisaged and with this in mind, some extra attention was given to the tunnel at this location with the remote possibility in mind that it may be converted later. The south headwall that ends the enlarged tunnel. A length of about 200 metres of rail tunnel was aligned to be perfectly straight and an enlarged diameter of 8.25m was used for about 15 metres of this length to make the start of constructing a new platform at this location easier. Although the widened tunnel wasn't the full length of a standard Underground platform, this advance work would make the construction of a future single platform station a lot easier. 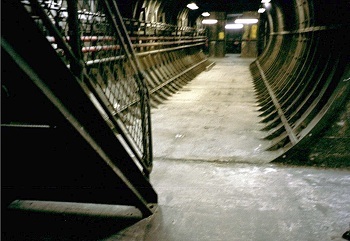 A walkway from the shaft to the rail tunnel. 20 years after this tunnel was built, construction work took place on Heathrow Terminal 5. Despite these plans, it wasn't built in the originally supposed location, leaving this specially treated section of the line over a kilometre away from the location finally decided for the terminal. For this reason, this remarkable bit of foresight is not being used and a different part of the loop is currently being prepared to be converted into a station. Since the tunnel is actually connected to the surface via a metal staircase, it could in theory still be used as an emergency egress point in times of emergency in the same way most of the other abandoned stations could be used. So, this location can't really be considered an abandoned station since it wasn't completed, but like Bull & Bush on the Northern Line, deserves a mention as it could well have become an active station! All photographs and research material on this page provided with thanks by Ewan Benett and used with permission. All material on this page is © 2001,2003 Hywel Williams unless otherwise noted.